Assault Rifle AR Kit similar to the one in Halo 5, 3d printed, Cosplay It is roughly 33” from end to end. This gun is a kit so you will have to assemble and glue it. I will provide screws. You will need to get epoxy or super glue. Loot Crate Exclusive. Hook and Loop Fabric bottom for attaching to fabric. 100% Polyester. A premium edition of Halo 5: Guardians for collectors and Halo fans alike. 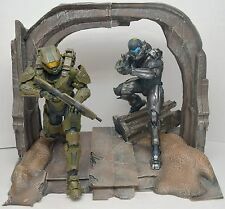 Spartan Locke Statue. Up for sale is a Halo 5: Guardians Collector's edition statues. Master Chief Statue. Product Specifics. Very strong and durable build quality. You can see through the visor. Has realistic battle field scuffs. Has nice foam padding inside to cushion your head. Also looks amazing on display. Perfect for any halo fan! These have never been used and are in mint condition. The card has a unique foil finish to it that shines in the light. 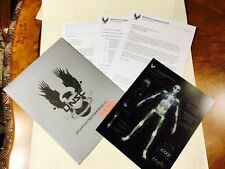 Halo Icons Series 2 Loot Crate Exclusive Figure CARTER A259 Collectible NEW!! Halo 3 Legendary Edition. Condition is used. Box shows some wear. Unsure if complete or not, as it was bought used. Condition is New. Perfect for any Halo cosplay or other prop use! See pictures for more information and details. Loot Crate Halo Crate Exclusive. New Loot Crate HALO Sgt. 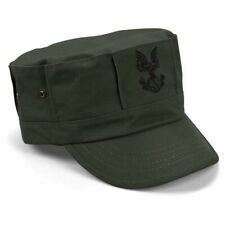 Johnson Hat UNSC Replica Military Cap RARE. 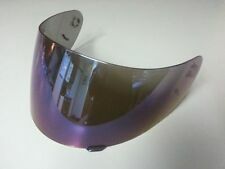 Condition is Used, minor scuffs, small scratch on left side of visor. These are the photos of the actual item. Halo Reach Legendary Edition. Condition is Used. Great Condition. Believe everything is here. 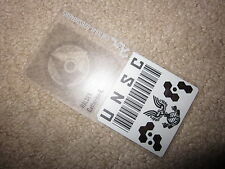 Up for sale is a rare Halo 2 Promotional Lanyard. 12” huge Halo 5 Statues. HALO 2 Truckers Hat - Xbox promo - New with tag - Rare! HALO ICONS JUN-A266 SCREEN SHOTS SERIES 3 LOOT CRATE . Condition is Used. Shipped with USPS First Class Package. I have others available check my other items for sale. Halo Loot Crate Screen Shots Halo Icons Flood Infected Marine Figure NEW Xbox. Condition is Used. Shipped with USPS First Class Package. I have others listed on my store please xheck them out. 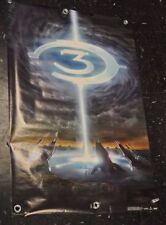 Halo Wars 2 Three Piece Pin Set Promo Collectible Sealed. Condition is New. I will Ship item within 24 Hours of Purchase. 1-3 Shipping!!! Thank You. UP FOR SALE WE HAVE A HALO 3 KEYCHAIN WRISTBAND LOT. 1 of 6 Limited Edtion Variant. Loot Crate. Halo Icons. All of the monies collected from online sales go back into the running of our outreach centers in. To see what we are working to achieve or if you could help in any further way. Halo 3 Legendary Edition Collectible Helmet Display Stand & Extras Dvd (No game). Extras DVD is sealed (this is not the game disc). Master chief helmet and contents are in excellent shape. Minor cardboard wear on outer box sleeve (see pics). You are purchasing The Sticker Shock weapon skin set Fireteam Apollo emblem on Halo 5: Guardians. The Fireteam Apollo emblem is 100%exclusive and was never made public in anyway. Halo Icons: Atriox Loot Crate Screen Shots Figure. Condition is Used. Shipped with USPS First Class Package. I have others available check my other items for sale. This VERY RARE Promotional "The Making of Halo: Combat Evolved" DVD was released at the launch of Halo in 2001! The overall condition is terrific, with only very minimal signs of wear on the corners/edges from being in storage for so long. Halo Icons Figurine - Hunter - Legendary Loot Crate. Condition is Used. Shipped with USPS First Class Package. Missing one spike see photos I have others available check my other items for sale. The pictures show the front and back of one of the coins but you have the option to buy more than one and the coin(s) will be selected at random from the collection. Examples of these imperfections can be extra or darker shading/grunge effect paint on the front, minor bubbles or small marks, etc.